OPSC is recruiting Mechanical and Civil Engineers for the post of Assistant Executive for the year of 2015. Eligible candidate can apply here on or before 27th May 2015. The Odisha Public Service Commission was constituted on 1st April, 1949 after it’s bifurcation from the former Bihar and Odisha Joint Public Service Commission. The Commission has acquired varied experiences and expertise in the matter of selection of personnel to various services of the Government of Odisha during its functioning for more than six decades. It has also gone a long way in achieving the purpose of drawing the best personnel for the public services of Odisha. Eligible Candidates can apply online on or before 27.05.2015. Job Descriptions and other details kindly check the official notifications. 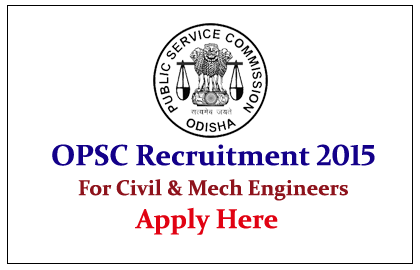 The candidates are required to visit the Website of the Commission at http://opsc.gov.in for detailed information about the programme of the examination/interview, notice regarding rejection of applications; other important notices etc. and also keep track of publication of various notices to the effect in the leading local daily news papers for information.